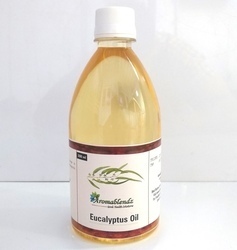 Our range of products include aromablendz eucalyptus steam oil 70% and aromablendz eucalyptus steam oil 50%. Use as: A strong antiseptic & immunity booster post workouts & for relief from running nose during common cold. Method of Application: Put a few drops of the reconstituted oil in a steamer, bathing water or steam inhalation. Composition: Reconstituted Eucalyptus Oil 70% concentrate. Warning: For external use only. Keep out of reach of children. Do not ingest or apply directly on skin. Use as: A strong antiseptic & immunity booster post workouts & for relief from running nose during common cold. Method of Application: Put a few drops of the reconstituted oil in a steamer, bathing water or steam inhalation. Composition: Reconstituted Eucalyptus Oil 50% concentrate. Looking for Aromablendz Steam Oils ?